Back in April, I noticed that Miles had shattered the largest of his upper back teeth on the right side of his face. I took him to our trusted vet right away, and he said what I figured he would say: that the tooth needed to be removed. He booked Miles for surgery right away. Miles’ veterinarian and I have a very good relationship. After Miles’ lumpectomy last year, I knew what to expect with this surgery. I dropped Miles off in the morning. He was scheduled to go first. When mid afternoon rolled around, I hadn’t heard from our vet. He calls right after finishing operating on Miles, so I started to get antsy. Over three hours after Miles’ surgery was scheduled to begin, the vet called me. The extraction had taken him three solid hours! Some dogs, he said, have teeth that are fairly straightforward to remove. This is not the case for Miles. This particular tooth had three very deep roots. The tooth area right after Miles came home from extraction surgery in April. For a clearer picture, click here. Post surgery, the first thing Miles did once back at home was to go and sunbathe. It took our veterinarian over three hours to remove this tooth. The tooth looks big, until you see the size of the roots — all three of them! At the follow-up examination appointment, I brought our veterinarian a thank you. I researched what the tooth he removed looks like, drew it on art paper, and cut it out to make a special card for him. I am very grateful that Miles has such an excellent veterinarian. The recovery took a solid two weeks, during which the right side of Miles’ face was swollen. I kept him comfortable at home, and he was content to sleep most of the time. Our little scraggly recovering chipmunk faced dog. 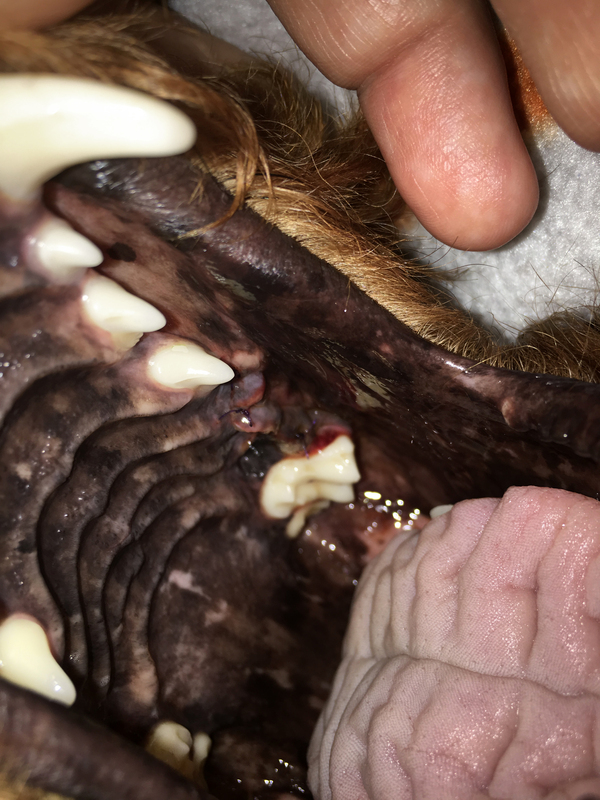 Last Tuesday, around six months after Miles’ first tooth extraction surgery, his other upper carnassial tooth broke. He let me know by sitting at the couch, and quietly whimpering at me. I asked him if he needed to go out, and he didn’t run to stand at the front door. I checked him for any signs of problems, and noticed the tooth right away. The root was completely exposed, a bright red dot in the middle of the white tooth. The picture I got of it (above) isn’t that clear, but you can see that the top of the tooth is missing, and the root is exposed. I fed Miles his dinner that evening, and then fasted him on Monday morning. At 11am, the clinic called me, and told me bring Miles in. Our vet still had his a full day of surgeries, including the major one with the specialist, but he had decided to stay after his regular shift was over to operate on Miles in the evening. Can you believe that? What a guy! I brought Miles in, and he went under for surgery at around 4pm. I was running errands at 7:45pm when our vet called me. He had just finished operating on Miles, and it had once again taken over three hours to extract the tooth. Miles had done well being under that long, and was being taken off anesthesia. Because our vet would be leaving right after surgery, Miles would have to stay overnight for observation. I trust our clinic, and understood that it was for the best to have him in qualified hands, in case there were any complications as he came off of anesthesia. Our vet clinic has excellent overnight staff, and they work closely with the city’s top 24-hr emergency clinic, which is directly across the street. Yesterday morning (Tuesday), the first vet that got in verified that Miles was good to go, and I picked him up right when they opened. Miles’ mouth the morning after the October extraction surgery. For a clearer picture, click here. Miles had clearly been very well taken care of during his overnight stay at the clinic, for which I was extremely grateful. It was wonderful to pick him up and bring him home! He spent his first day and a half home post-surgery napping (above). This afternoon, he got up around 3pm, and brought me one of his toys! This time, there is much less swelling. Despite the bad luck of both of his carnassials breaking, Miles is one very lucky little guy. I couldn’t ask for a better veterinarian. Miles could write a book about all of his adventures! Wow! I am so glad to hear that Miles is recovering from this tooth extraction with much less swelling. He is a lucky guy to have such a great veterinarian, and such a great owner too! Even though you trust your vet clinic, I would have had a hard time letting him stay overnight. Now, here are the things I’m wondering – will you change the things you give him to chew on now to avoid further broken teeth? (I know you don’t give him super hard things, but it still happened). Is this a common occurrence? Or do some dogs have teeth that are less strong? 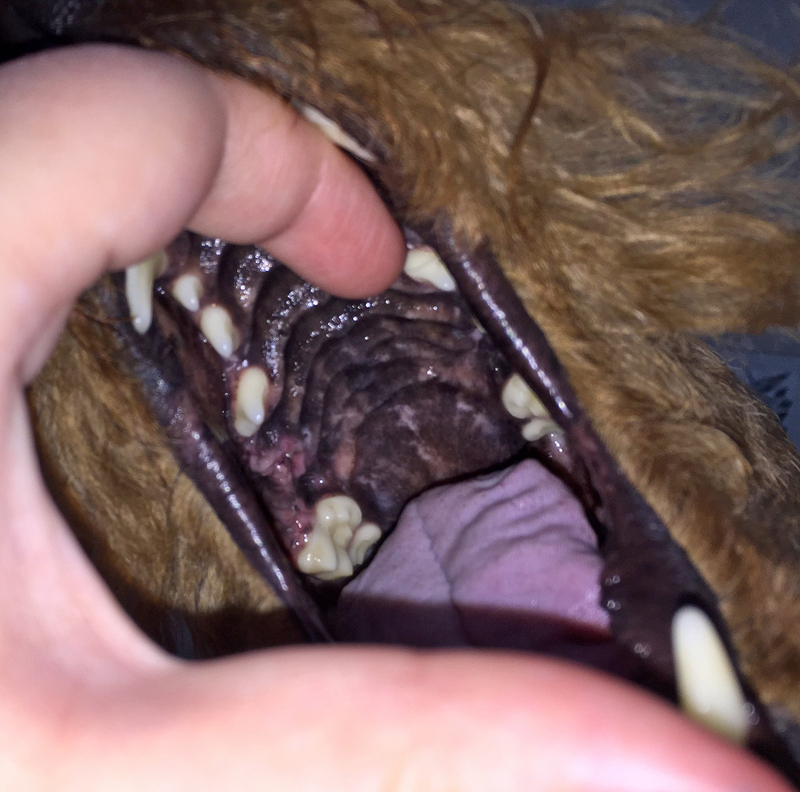 Once Miles is recovered, will chewing things be more difficult because those big teeth are gone? Hugs!!! Wishing Miles a speedy recovery from us and Oliver!! Yes, leaving him overnight should have felt harder than it did — I was so relieved he got in for surgery a full week earlier than expected, I really just swallowed that fear, knowing it was the right thing to do. Plus, like I said, my vet clinic really couldn’t be better and safer for overnight stays. As for the future of Miles’ teeth, and what he chewed/will chew etc, that is definitely what I should post about next! Miles’ regular diet and chews won’t change much, if at all. He doesn’t eat kibble, which I imagine would be much more difficult to grind up without upper carnassials (imagine trying to eat something like corn nuts without back teeth! ), so that is good. He will still get select safe bones, chicken necks, and bullysticks. Hi, my golden Obie broke his lower carnassial tooth. I was wondering what the long term effects of losing those teeth were. Like what does it miles mouth look like after extracting those teeth, does plaque occur on the opposing teeth, can miles chew/eat like normal not just soft food and do you regret not doing root canals.